Popeye first appeared in a 1929 daily comic strip called Thimble Theater by Elsie Segar and caught the country by storm. Popeye had nothing but his wits, a funny way of talking, and a crush on Olive Oyl. His fame eventually caught the attention of the Max Fleischer Studio and by 1933 Popeye had made his big screen debut in a Betty Boop short entitled Popeye The Sailor. The WWII years brought change to the spinach munching sailorman. 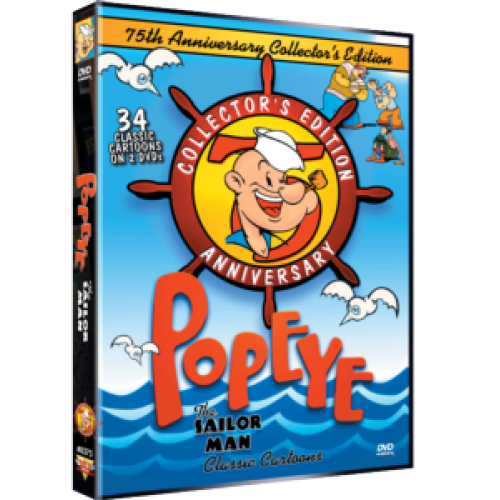 In 1942, Popeye's uniform changed permanently to Navy whites and the same year, Paramount took over the production studio from the Fleischer brothers and renamed it Famous Studios, which continued to produce some superb entries in the Popeye series. In today’s politically correct cartoon landscape of talking sponges and ninja turtles, Popeye is a welcome reminder of a simpler era. 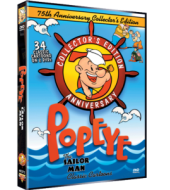 This special Double-DVD Collector's Edition contains 34 Popeye cartoons from the Fleischer and Famous Studios period, including the three Fleischer 'Color Specials' Sinbad ('36), Ali Baba ('37) and Aladdin ('39) -- some of the very best ever produced. All cartoons have been digitally restored and remastered from the best 35mm and 16mm film materials available.